Now that the Summer tires are on and the brake-wear light is off, the Boxster is almost ready for the top-down weather. We say “almost” because back in March when we had that mini heat wave, we noticed that the car’s A/C was not really performing up to par. Apparently, to prevent the seals from drying out, we were supposed to run the A/C system once in a while if the temperature got above 50º. Never knew or ever did that. After 10 years, it was not surprising that enough refrigerant had leaked out of the A/C system to render it ineffective. Going to an auto shop to have the A/C system recharged typicallys cost between $100-$200. However, we were curious as to whether we could do ourselves at the RainyDayGarage. According to Bentley’s Boxster Service Manual, the access ports for recharging the system are on the passenger front side of the car. While the manual has detailed diagrams on how to replace the A/C compressor, there was nothing about how to recharge the system with refrigerant. 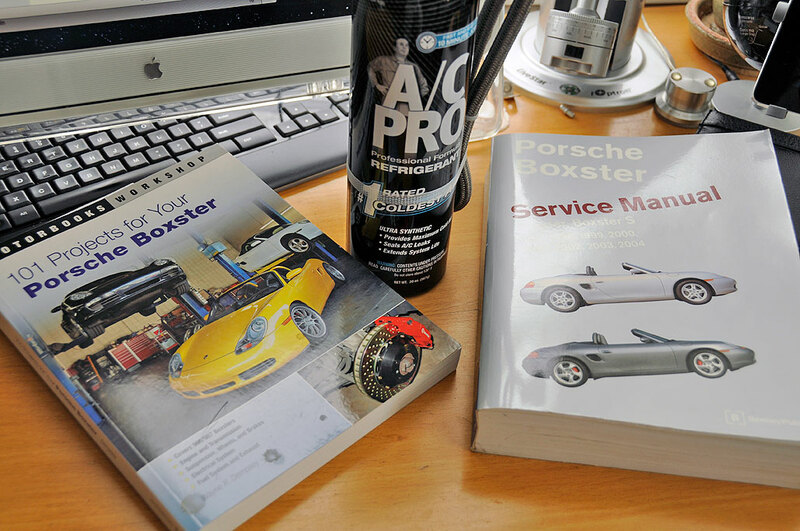 Fortunately, Project #97 of Wayne Dempsey’s 101 Projects for Your Porsche Boxster covered the topic of air conditioning maintenance and recharge. The directions ere excellent, with the exception of one small omission. Dempsey assumed that the user already knew where the A/C ports were located. Not a huge problem, but if we didn’t have the Bentley manual, we would have fumbled around a bit looking for the A/C port. After consulting our Bentley Boxster Service Manual and Wayne Dempsey’s Boxster Projects book, we felt confident that recharging the A/C system was something we could do ourselves. The materials listed in Project #97 run about $50 and would take about an hour. We did a little bit of research and found that IDQ has recently introduced the A/C PRO. The A/C PRO is a self-contained recharging unit which looks like it has everything we needed: R134a refrigerant, connector hose, gauge. With the IDQ A/C PRO recharger, “all” we have to do is connect and fill. The project may take us no more than 10-minutes. Tomorrow we’ll wrap up this little RainyDayGarage DIY project with a write-up of our efforts. Once the A/C is chilling properly, then we’ll be ready for Summer!